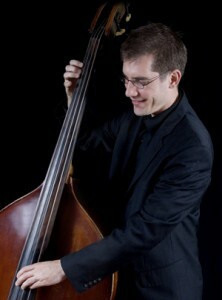 Originally from the small town of Zanesville, OH, Greg Loughman started playing electric bass at age fifteen. He obtained a Bachelor of Music in the field of jazz studies at Capital University, where he studied electric and upright bass with Doug Richeson (bassist for a number of years with Tony Bennet), Jeff Ciampa, and Lou Fischer. After living in Columbus, OH, then spending a year in Montana, Greg moved to Boston, where he continues to pursue an active schedule of performing and recording. He has performed with jazz greats including George Garzone, Jerry Bergonzi, Curtis Fuller, JoAnne Brackeen, Mark Murphy, Sheila Jordan, Judi Silvano, Kenwood Dennard, as well as Grammy-nominated pianist Phillip Aaberg, Brazilian multi-instrumentalist Carlos Malta, and singer Patti Page, among others. His musical career has taken him on tours of the US, Europe, the Caribbean, and Japan. Currently, Greg leads his own indie rock group, Lowman, his own jazz trio, Sinistral, co-leads the groups, Roving Soul and ManOnLand, and plays in the John Funkhouser Trio, the Rhythm Future Quartet, Klezwoods, Britt Connors & Bourbon Renewal, Sonic Explorers, and many others. Greg is also an in demand studio musician in the Boston area and teaches private lessons from his home or online.